The stories you won’t hear before the sun goes down. 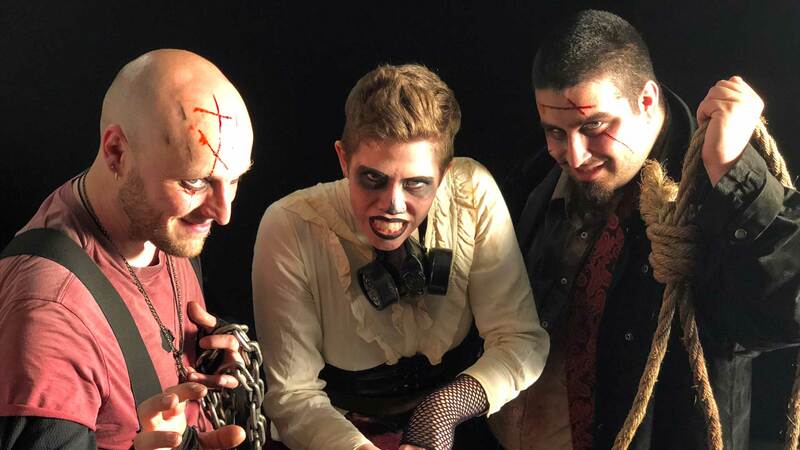 Guided by a ghoulish band of the undead and a roguish gravedigger, the Trolley of Terror will go back in time as you relive grisly murders, heinous torcherings and cold-blooded executions like the ones that took place on the Boston Commons. 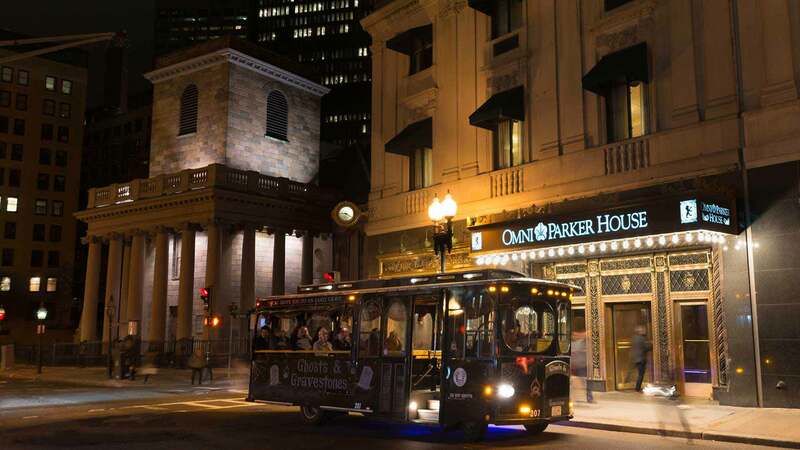 Learn about the paranormal hi-jinks going down at the Omni Parker House, the legend of the Boston Strangler and visit King’s Chapel cemetery where the bones of the dead served as currency for a man named Ephraim Littlefield. This rates the level of authenticity and historical accuracy of the content you’ll encounter on the tour. This ranks the intensity of the chills you’ll experience as well as the overall spooky factor. Whether it’s a scare that makes you jump out of your shoes or if something else does the jumping, we rank it here. Walk amongst the dead in burying grounds nearly four hundred years old, hear stories of those whose mortal remains lie beneath your feet, and listen to tales of many of the sordid practices that went along with them. Venture to the site of the biggest grave-robbing scandal in New England’s history. And ask yourselves – are you afraid of being buried alive? 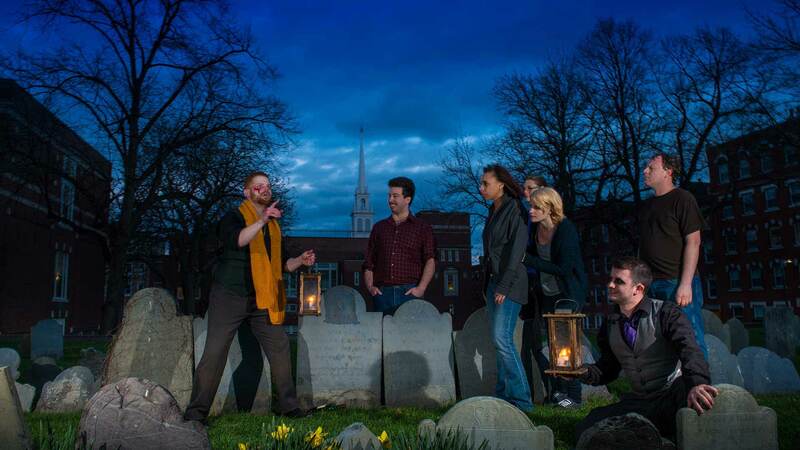 Walk atop Boston’s largest unmarked burying ground and hear tales of the tortures, punishments and executions that took place there. 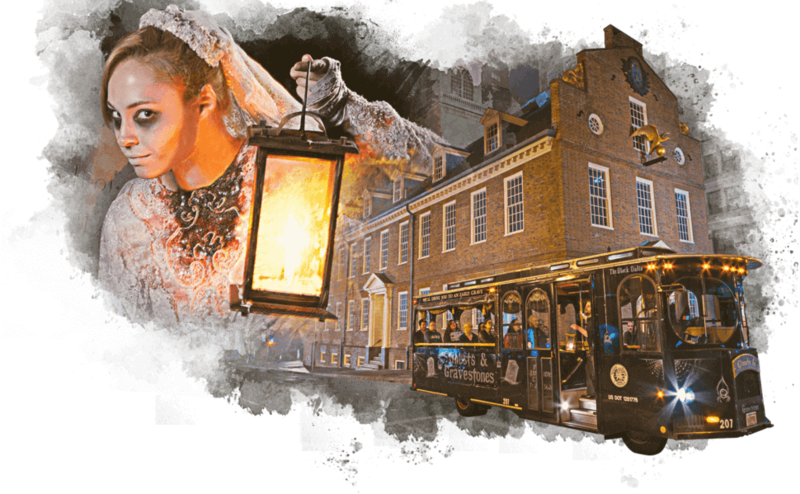 You may even find yourselves involved in some… To learn more, go to our Boston Ghost Tour. Underground tunnels, unmarked graves, public executions, grave robberies, a day of darkness and a full red moon – all a part of Boston’s shadowy past and according to many accounts, its present. A city steeped in history, it is not surprising that Boston has more than its share of haunted tales. You’ll have an exclusive opportunity to visit the final resting places of some of the city’s most prestigious residents – many whose ghosts have been seen on the grounds. 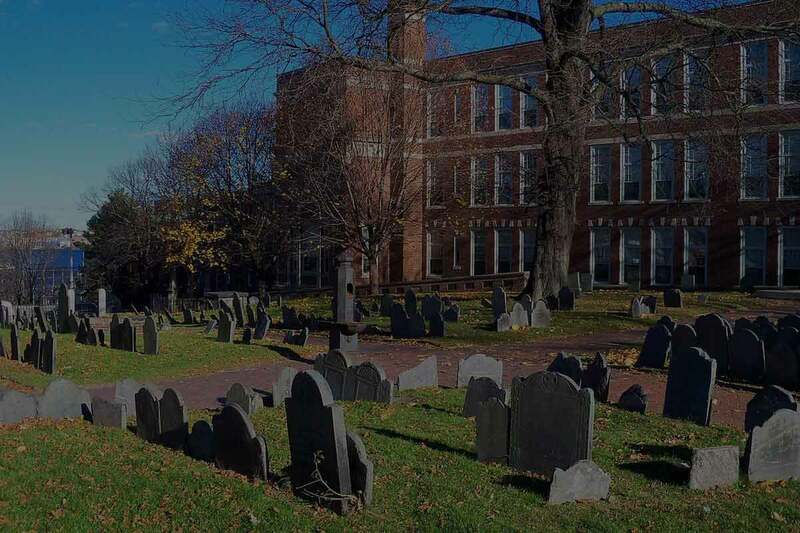 The tour takes you to two of the city’s oldest cemeteries including King’s Chapel Burying Ground, Copp’s Hill Burying Ground or Granary Burying Ground. Don’t be surprised by the eerie sensation that overtakes you as you walk amongst unmarked graves and hear the accounts of those who were buried alive. Through the years, there have been numerous accounts of paranormal activity, strange sounds and unexplained orbs of light. Some of the mysterious sights are said to be Harvey Parker, the hotel’s owner whose ghost has been seen roaming the halls, walking through walls and even appearing at the foot of the bed in several rooms. Other ghostly encounters could belong to other spirits attached to the iconic hotel, including the man who committed suicide there in 1949 and five students who were accidentally killed on the grounds in 1770. Considered by many to be the most haunted place in the city, Boston Common is where public hangings were held until 1817 and where many Boston inhabitants who were executed or witnessed them are rumored to still be hauntingly present. You’ll hear the accounts of the two 19th century women whose spirits have been seen walking down the street and the ghost of the young woman dressed in black. 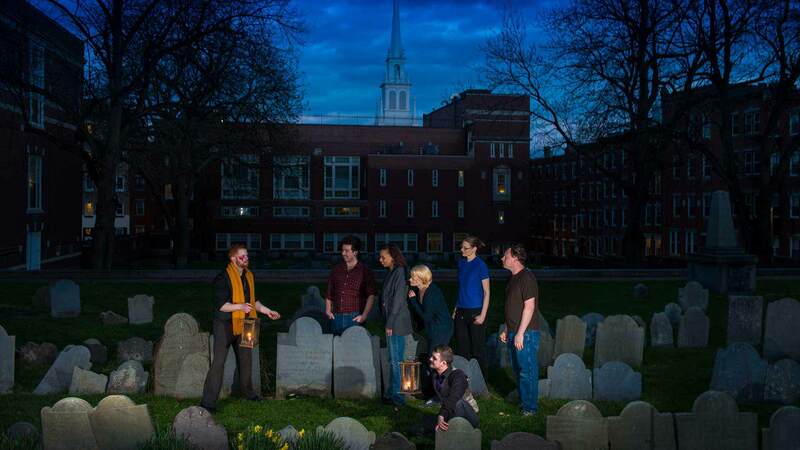 The Gravediggers are Boston history experts who love to share and scare. They do more than act out their part, they assume the personality, style and dress of their characters. From the moment you meet them in their costumed attire, you’ll feel you’re in the company of a cursed privateer, a deranged nanny, a homicidal opera diva, a pyromaniac circus ringleader – or whoever you are lucky enough to be guided by that night. There’s no better way to celebrate All Hallow’s Eve than on the Trolley of the Doomed. 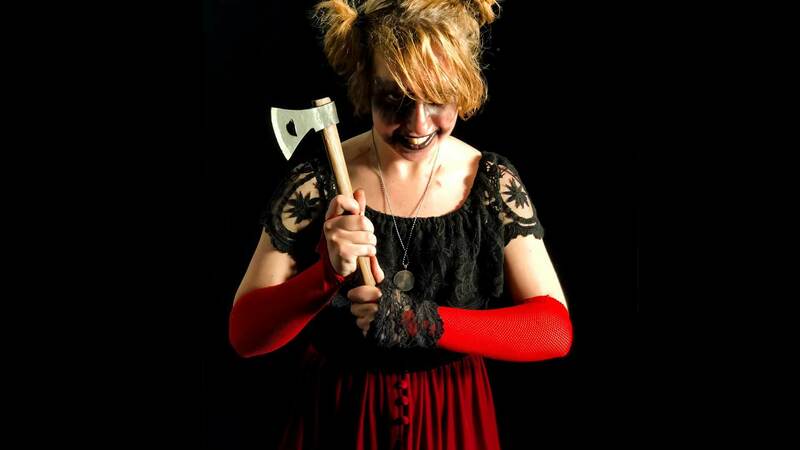 Wear your costume and enjoy a night of apparitions, frightening accounts of murder, mysterious sights, chilling sounds and more. 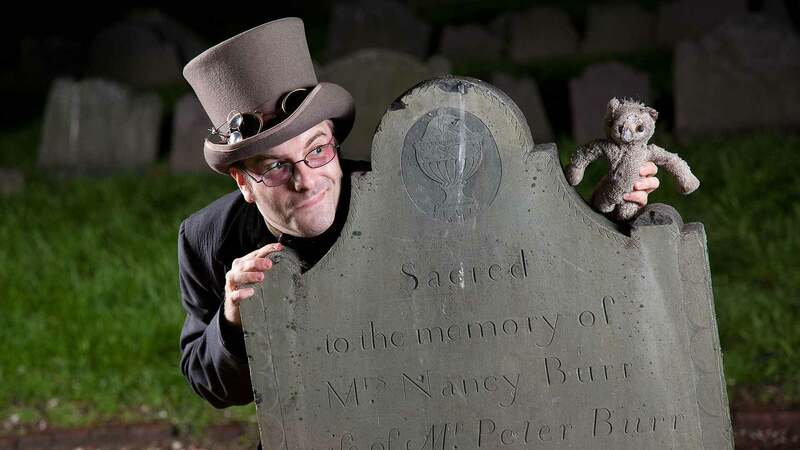 Of course, any time is a good time for a Ghost Tour; so Boston’s Ghosts & Gravestones is ready to transport you to the next dimension April through October. Ghosts & Gravestones Frightseeing Tour boards beside the Marriott Long Wharf Hotel on 200 Atlantic Avenue, corner of State Street. Warning: This Tour may not be suitable for children under 13 years of age. Due to the loud noises on our tour, children under the age of 6 are not allowed onboard. 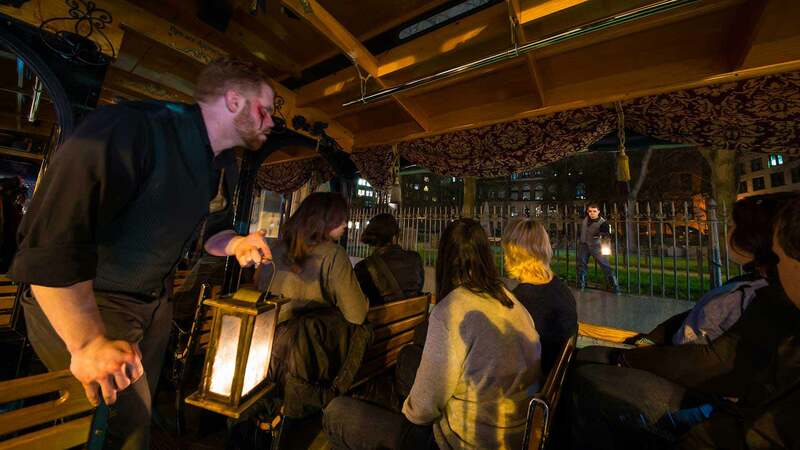 Be prepared to be scared as the Ghosts & Gravestones trolley winds its way through Boston’s most sordid past—through 400 year-old burial grounds where you’ll hear tales of grave-robbing, tortures, punishments, executions and even some folks being buried alive! 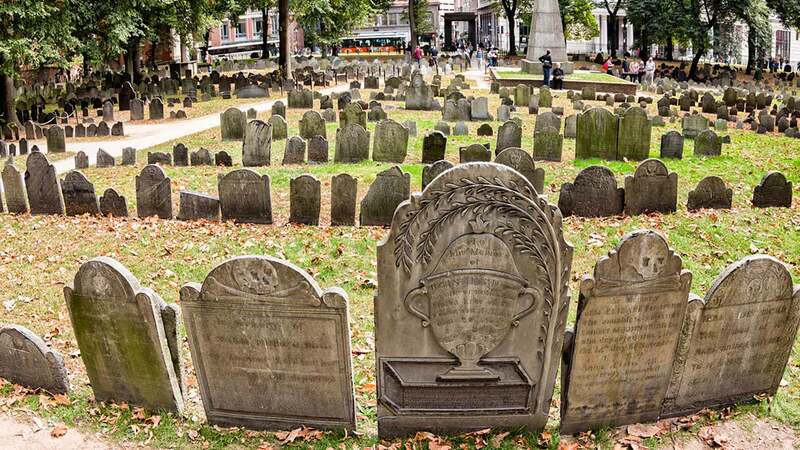 Boston’s ancient burial grounds are the final resting place of many of America’s most famous and infamous colonists. They are also well known for their paranormal activity and lingering spirits. If you’re curious and interested in a ghostly encounter, stop in for a visit at some of the most haunted cemeteries in Boston. The Omni Parker House is considered by many as the most haunted hotel in New England. Founded by Harvey Parker in 1855, he was the hotel overseer and resident until his death in 1884. Harvey was well known for his interaction with guests and providing pleasant accommodations. Where there is history there is always mystery and the great state of Massachusetts is no exception. When you look beyond the famed historic landmarks, architectural wonders and popular attractions, there is darkness and tragedy, spirits of the dead and lost souls who wander about the buildings, streets, parks, graveyards and open spaces, never wishing to transition to their next life. Copp’s Hill Burying Ground is the second oldest burial ground in Boston and was founded in 1659. Named after shoemaker William Copp, this historic cemetery in the North End is the final resting place of many merchants, artisans and freed slaves. Well-known colonists, Cotton and Increase Mather, are buried here along with Robert Newman, who hung the lanterns for the Midnight Ride of Paul Revere. Located on Tremont Street, the Granary Burying Ground is the final resting place of some of America’s most important historical figures. Samuel Adams, John Hancock and Paul Revere are among the famed patriots who are buried here, along with the family of Benjamin Franklin, several Massachusetts Governors and the victims of the Boston Massacre. Please arrive for the tour fifteen (15) minutes prior to the departure of the tour as all tours leave promptly. See below for parking available near our departure point. Please note that these are not run by Ghosts & Gravestones.